1) Start Admin server and OAM Managed server. 3) Webgate Instance creation help. "Usage : deployWebGateInstance -w -oh "
which creates back up for already existing httpd.conf file and creates new httpd file with configuration in webtier instance. 8) Modify take back up of OAM11GRequest.xml file and modify as shown in below image with required URL. 12) Check if domain got created or not in OAM console. I got little bit problem. After doing this lab I am getting problem with OIM identity self service in "User" if I click on "Create" I am getting fallowing error. "MDS-00010: DuplicateRefException. In document /oracle/iam/ui/runtime/form/view/pages/userCreateForm.jsff there are multiple elements with the same ID _xg_pfl0. ADF_FACES-60097:For more information, please see the server's error log for an entry beginning with: ADF_FACES-60096:Server Exception during PPR, #1"
I tried even by shutting the servers but problem still exists. I want to see the LOG file. But problem is with path. Don't know where it is exactly located. Can you please provide exact change you have done. And also the above lab is for OAM not OIM so . 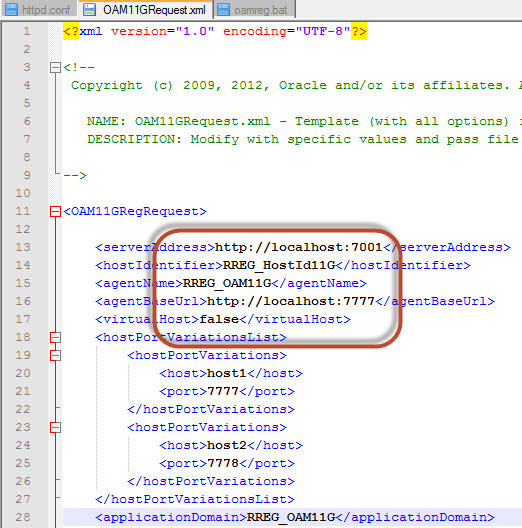 OAM and OIM are in single server. I followed the same changes what you have given in the above lab. I want to know where will be the LOg file path for this error. Are you getting this error when you are trying to search users? It says there are multiple users with same ID thats throwing problem I guess. what is the procedure for to do SSO all fusion applications single sign on using OAM 11g. how can approach this requirement ? any ideas please help me. i had executed up to lab 4, when log in to 7777 port, its only log in to OAM Console only, how can i do it for all fusion urls?